Phyl's Blog: HOW MANY DOUGHNUTS (DONUTS)? When Pudge and I were in Manhattan a few years ago we decided to go up the Empire State Building one morning because our jet lag had got us up so early there was no queue yet. Figuring we'd be hungry before we'd done our sightseeing, I decided to buy a couple of donuts to go in a bag. Luckily there was a donut shop just across the road so I went in and asked for two. The man behind the counter looked at me as if I had asked for two live chickens in a bag. 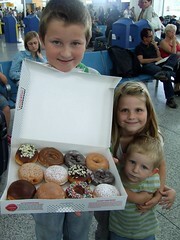 He proceeded to explain that donuts were so much cheaper to buy by the half dozen. I pointed out I was alone with a baby and two would be fine. I probably ended up paying as much for two as I would have for six, but I didn't see any point in carrying four spares around all day. Last night Lots and Thomas decided to make homemade doughnuts for breakfast for the first time. Thomas had a well-known American cookbook called 'Joy' and he and Charlotte disappeared into the kitchen for the best part of yesterday evening doing odd things with dough and yeast. It seemed like a lot of hassle. They made one batch of doughnuts as explained in the cookbook. This morning they were ready for frying. The one batch as recommended by the American cookbook contained approximately thirty donuts and mentioned they had to be eaten within two hours of frying. I assume most American families have two, maybe three kids at the most, so their breakfast batch suggests you should be eating six or even seven large donuts each for breakfast! Suddenly I understand both why the bloke in Manhattan had mocked my order of two donuts and why Americans aren't generally the skinniest people around! I can still feel my arteries hardening when i think of the "fresh" doughnuts we used to get in candleriggs market.